In this weekly update, I wanted to wish the readers and followers of The Apartment Homebrewer a happy, safe, and hopefully beery St. Patrick’s Day. I’ll be enjoying a full Victorian pint of my Session Oatmeal Stout, eating a full plate of fish and chips, and listening to my favorite Celtic band, Gaelic Storm. (for Irish music lovers, more on this below). As apartment brewing is concerned, this week I spent most of my time watching the airlock bubbling on the Passion Fruit American Wheat Beer I recently brewed. Since pitching Monday, fermentation has slowed considerably, but still going, with a creamy krausen atop. This week, I’ll be racking the fermented wheat beer onto the passion fruit juice for secondary fermentation. 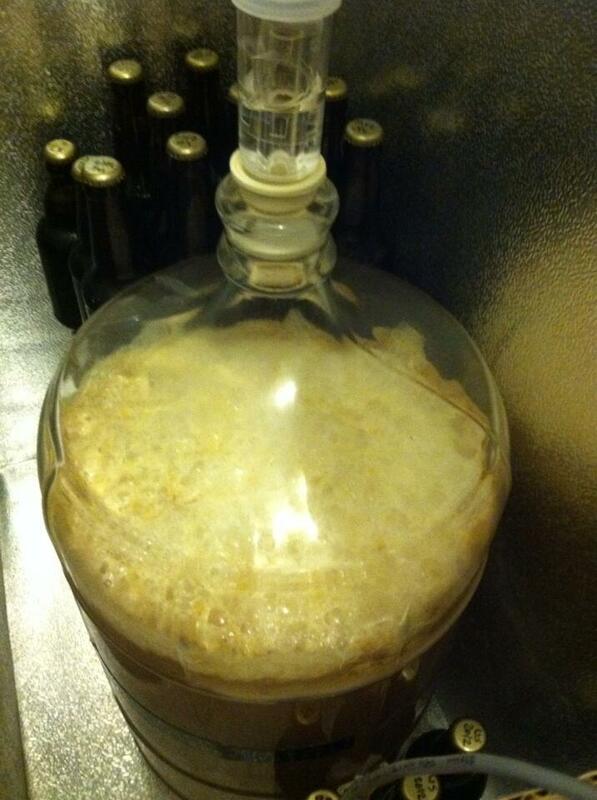 Also, I’ll be saving the yeast for a brew day later this week. I’ll try to brew it on the equinox and it will be a single hop experiment, Falconer’s Flight APA. More on this later. Staying on a St. Paddy’s Day theme, recently, I was able to see Gaelic Storm perform live at the Belmont in Austin, TX. In short, they were fantastic, and as most people say, were better live than recorded. For those who saw the epic blockbuster, Titanic, Gaelic Storm appeared as the steerage band in third-class when Jack and Rose danced, and through this, received their “big break”. Titanic aside, the band has had many hits since then, and more of my favorites is their rendition of the early twentieth century drinking song, Johnny Jump Up, linked as a Youtube video below. The song originates from the years during World War II, and centers around a strong cider known as Johnny Jump Up. Legend has it that during the War years, cider produced in southern Ireland was stored in used whiskey casks since barrels were in short supply. As a result, the whiskey-soaked barrels leached out their distilled strength into the stored cider, resulting in a strong, boozy and flavorful cider. I’m not entirely sure if all of that is true, but the song is still great. Today, a Johnny Jump Up is referred to as a whiskey/cider mixed drink that can get you into trouble fast after a few. On a homebrewing level, I always thought it would be fun to replicate the Johnny Jump Up cider on the small scale by making a strong cider, then ageing it with whiskey-soaked oak cubes. Maybe soon. But for now, cheers, and happy brewing (and happy St. Patrick’s Day)!